Happy Equinox. 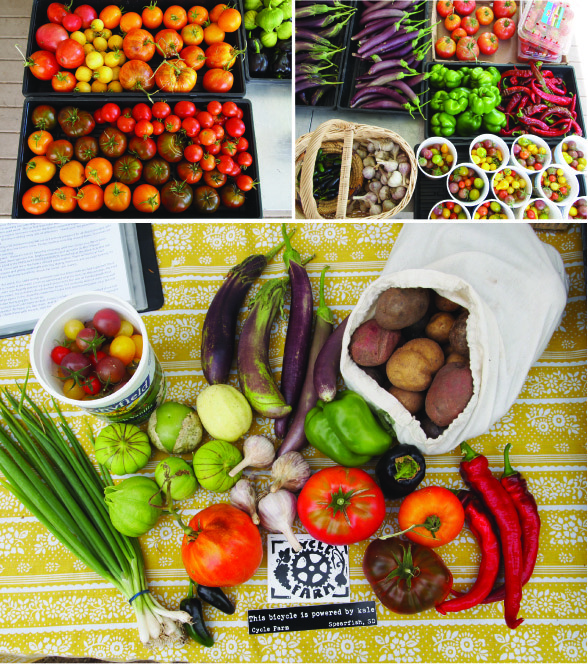 It’s a nightshade-heavy week for the CSA, chock-full of tomatoes, tomatillos, eggplants, peppers, and potatoes. Here is a link to the CSA newsletter. The share this week also included Cycle Farm stickers. Hooray! These stickers are not only fabulous, they are also a marketing strategy. We’re finding that our produce sales are not paying for the farm (for themselves maybe, but for our labor and all these initial infrastructure projects.. not even close), so we’re experimenting with a broader market. 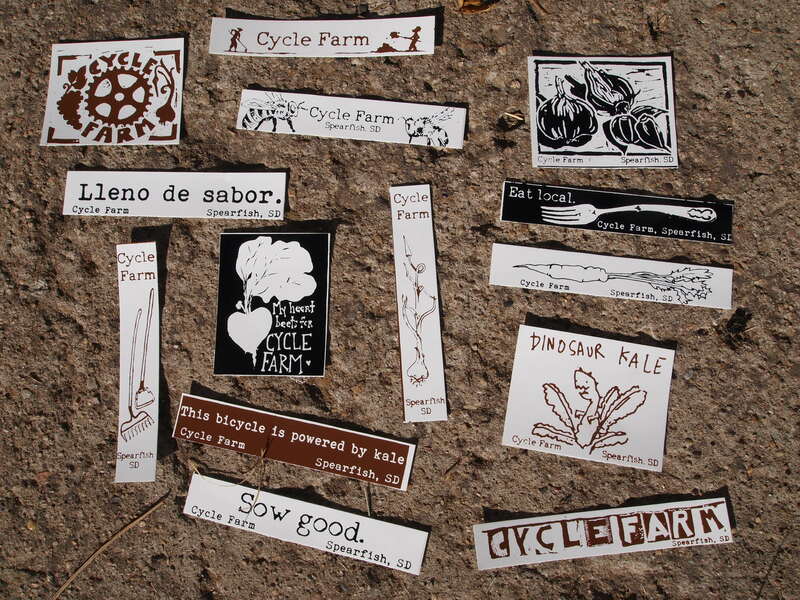 If you are interested in showing your support for local agriculture, Cycle Farm, dinosaur kale, vegetables and art, etc., let us know – we have stickers for sale. James from Binky Studio in Spearfish did the printing for us. He has a magical, revolutionary workshop in his garage where he makes art. Brilliant. Many thanks to Black Hills Milk and everyone who came out for the Introduction to Food Preservation workshop this past Saturday. And extra special big thanks to the generous instructors for sharing their knowledge and experience, and feeding us all so well. Here are some photos… beet kvass, water kefir ginger beer, kombucha; bread and butter pickles; preparing sauerkraut; raspberry and chokecherry jellies; bubbly lacto-fermented carrots and daikon (not pictured, but equally as delectable: dehydrated plums and tomatoes, zucchini and apple chips). Put it up! As if to celebrate the changing of the seasons, we had our first frost on Saturday night. We have been watching the forecast nightly for the past two weeks. On Saturday, the night forecast was for low 40s, so we tucked away to bed completely unprepared for what we found in the morning. There was icy crust on the chicken tractor in the morning. The thermometer at the house read 35 degrees F, and further out in the field things were coated in a light frost. The cucumbers and tomato plants looked as if they were toasted. Crispy. The watermelons were done for. The delicata, decimated. So we did a hurried harvest of what was salvageable. And spread out the row covers on the remaining eggplant, lettuce, and peppers. Usually harvesting is a fun, jolly activity, full of happy exclamations and admiration towards lovely fruits and heaping baskets. Though on Sunday afternoon, we worked quietly in the field. The frost struck as a unexpectedly quick buzz kill to our happy summer bounty. On the up-side, fall’s bounty is in full swing. We now have flats and flats of green tomatoes. Getting ready for green tomato chutney. Fried green tomatoes. Green tomato pickles and marmalade. Here we go. Winter wheat and field peas are in and up. We are collecting dry beans, Hidatsa shield figure, Bolita, Jacob’s cattle and Colorado river beans. Amaranth is drying. Winter squash are curing. And we are saving seeds from flowers, herbs, and the Grandpa admires’ lettuce. We’re excited to be cultivating regionally adapted varieties and are looking forward to setting up a local seed exchange early next year. And lastly, a word in support for our local deer hunters. May this season be a good one for you. This entry was posted in farm update and tagged CSA by Cycle Farm. Bookmark the permalink. Jeremy and Trish / I know that feeling…farming potatoes in the San Luis Valley was always pushing the limit on frost free days. Even here in Corvallis with our 200 days plus growing season it is sad to see the veges turn. Filling bins with potatoes is exciting and trees going yellow and red is exciting but vines laying over and turning brown, not so much. On a different note, I like your stickers, especially the one about pigs…Sow Good! Ours are over 250 lbs now and leaf lard pie crust is in my future! Ah – what a way to welcome Fall! Hoping that your hens will know it’s time to start laying (Dad says eggplant!) We’re wishing you better weather now! @#)($ I MEANT TO ASK YOU ABOUT STICKER PURCHASES TODAY!! Have you sold out!??! Do you still have some!?? I have interested buyers!! !